Founded by a clinical psychologist in 2000, eHarmony was the very first online dating service that used a scientific approach to matching highly compatible singles. After many years of counseling married couples, eHarmony CEO and founder Dr. Neil Clark Warren realized that the most successful and fruitful marriages involved highly compatible people and that this compatibility could be predicted based on certain characteristics. He developed a special Compatibility Matching System to help eHarmony members find compatible persons with whom they are most likely to enjoy a long-term relationship. Since then, the popularity of this dating site has grown exponentially and today it still ranks among the most widely used online dating services in the world. A long history of successful matchmaking and an impressive member base make eHarmony the dating service of choice for people who are looking for a serious relationship and marriage. 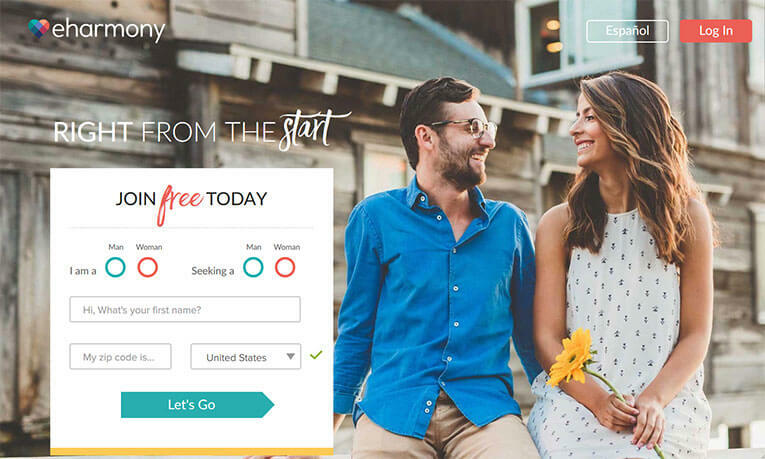 If you want to avoid the challenges associated with finding true love on an ordinary dating site, take a look at our eHarmony review to see if this widely known dating service suits your needs. eHarmony is available in English and Spanish. The initial dialogue box is simple and straightforward. After entering some basic details, you are asked to share some information about yourself. The first set of questions is related to the number of children you have, your date of birth, ethnic background, religious beliefs, income level, and smoking and drinking habits. You are also asked to state what you are passionate about, what your favorite activities are, and other details about yourself. The second set of questions is related to the person you are looking for – namely his/her age and the desired place of residence. Finally, you need to take the compatibility quiz, which is described as a proven method for matching compatible members. Here you will answer numerous questions about your personal traits, feelings, interests, and relationship values. Even though this may take a while and you may get bored, be sure to answer these questions as sincerely and accurately as you can since eHarmony will match you with suitable candidates based on the answers you provided. Meet Someone Special – Join eHarmony Now! After the somewhat tedious initial setup process, you’ll be taken to your profile page. Everything is plain and simple here, so even inexperienced users will have no trouble finding their way around the site. You can easily edit your profile, upload photos, and add as many details about yourself as you like. There are no bugs or lagging issues, so you can enjoy a seamless online dating experience. If you do happen to encounter some romance-related issues or concerns, eHarmony offers free online dating support. Advice from relationship experts is available to help you find your way through the complex world of online dating. eHarmony also provides help in finding people from your local area online. All services are available via the website, as well as on iOS and Android. As a non-paying member, you will get suggestions about compatible matches. You will be able to see their first name, location, date of birth, occupation, and some information about their interests and preferences. You will also be able to see how good of a fit they are for you based on eHarmony’s dimensions of compatibility. Of course, it is possible to send messages to the people you are interested in. However, to be able to see photos of other members, you’ll need to upgrade to a paid membership. 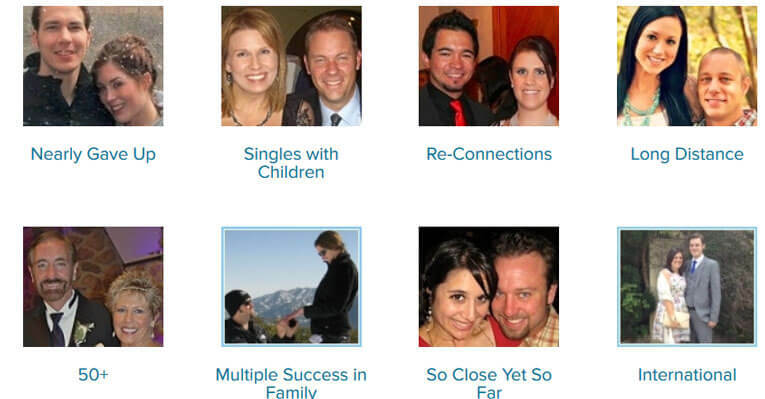 eHarmony offers several options. Among other things, a paid membership will enable you to see who’s viewed and favorited your profile, send and receive unlimited messages, browse matches anonymously, and get read receipts on all of your messages. And if you don’t have any success in the first 3 months of your online dating as a paid subscriber, the eHarmony Guarantee provides you with an additional 3 months free of charge. With millions of registered users in over 150 countries, the eHarmony member base is ethnically, racially, and religiously diverse and it includes individuals of all ages. This dating service had as much as 775,000 paying members in 2017. Most of eHarmony users come from United States, Canada, United Kingdom, and Australia. It is important to note that there are special sections of the site dedicated to Asian Dating, Black Dating, Christian Dating, Senior Dating, and Hispanic Dating. If you are only interested in casual dating, eHarmony may not be the right place for you. However, eHarmony is a great tool to use if you are looking for a long-term relationship or marriage. Its carefully designed matching system guarantees that you’ll find lasting and fulfilling connections on this site. All you have to do is let eHarmony help you find that special someone. I am looking for a long term relationship and I think eharmony is the best thing to choose. I absolutely recommend eharmony for the awesome people you can meet there.